It’s rather hard to believe we are entering the final week of the NFL regular season already. Hopefully my recommendations have been of some value for you in 2012 and you have already spent your winnings. But as noted last week, some competitions that remain tied after Week 17 spill into the playoffs, so I will write for the first two weeks in the postseason. Week 17 is always a tough one to pick in survivor pools. For many teams, you don’t know which starters will play. I certainly don’t expect to see Matt Ryan on the field much if at all for the Atlanta Falcons, who have clinched the top seed in the NFC. The Cincinnati Bengals and Indianapolis Colts are both locked into their wild-card seeds so Andy Dalton and Andrew Luck likely won’t play a full game. And if you are a team like Pittsburgh, which saw its playoff hopes vanish with last week’s loss to Cincinnati, why would you risk Ben Roethlisberger’s health in a meaningless Week 17? Another reason that Week 17 is a very tough one is that every game is intra-divisional, and you can usually throw out the records in those. So definitely wait until Sunday before submitting your choice. Last week my top pick was Carolina over Oakland, and I feel confident in saying you hadn’t used the Panthers yet this year. I certainly hadn’t recommended them. Tennessee vs. Jacksonville: Will either of these head coaches return? The Jaguars should tank it to improve their chances of getting the top overall pick in next year’s draft. They would own it with a loss and a Kansas City victory at Denver (yeah right). Otherwise K.C. gets it. I think Jacksonville does tank. Houston at Indianapolis: Texans still are playing for that top seed, while the Colts are locked at No. 5. Denver vs. Kansas City: So long Scott Pioli, Romeo Crennel and Matt Cassel. NY Giants vs. Philadelphia: The final game of the Andy Reid era. And almost assuredly the Michael Vick era in Philly as well. He will start Sunday with Nick Foles out. But the Giants have everything to play for and the Iggles obviously nothing, other than possibly getting the No. 3 pick in the draft. San Diego vs. Oakland: The Chargers will be facing either Matt Leinart or Terrelle Pryor with Carson Palmer out injured. That’s all the reason you need to take them. No question this will be Norv Turner’s final game as the San Diego coach. San Francisco vs. Arizona: 49ers obviously off the board but they are a lock. Seattle vs. St. Louis: Another lock. The Rams could be a sleeper next year. New England vs. Miami: The Patriots haven’t looked great in recent weeks, but they are still playing for a first-round bye. My one concern with New England this week is that if it looks up at the scoreboard at halftime and sees the Broncos crushing Kansas City. Then the Pats really have nothing to play for – presuming the Texans win in an earlier game -- and could pull some guys. Atlanta vs. Tampa Bay: Don’t touch the Falcons this week as noted above. Cincinnati vs. Baltimore: This should be interesting because the two could play again in the wild-card round next week. Baltimore could leapfrog New England to get the third seed if the Ravens win here and the Patriots lose to Miami. In that scenario, the Ravens would host Cincinnati to open the playoffs. Thus I expect very vanilla game plans from both teams in this one. Chicago at Detroit: Yes, the Bears have to win and have the Vikings lose to get a playoff spot. And it’s true the Lions are just pitiful right now (other than “Megatron”). But I still don’t trust that Bears offense, which might not have Matt Forte this week. That means it’s all on Jay Cutler, and that’s not comforting. New Orleans vs. Carolina: Put some futures money down on the Panthers for 2013. The Saints ruined many survivor pools with their loss to RG3 and the Skins in Week 1. Green Bay at Minnesota: I’m still stunned the Vikings beat Houston last week. They know they are in if they win. Aaron Rodgers never loses to Minnesota but could Sunday. Washington vs. Dallas: The second year in a row the Cowboys are flexed to the Sunday night game for an NFC East winner-take-all. It didn’t work out for Dallas last year, but it wouldn’t surprise me if the Cowboys upset Washington this year – Tony Romo is playing lights out. 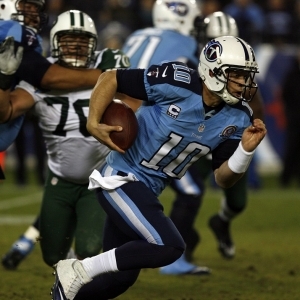 Buffalo vs. New York Jets: I am thoroughly enjoying watching the Jets implode. I wonder if either starting quarterback on Sunday (Ryan Fitzpatrick and Greg McElroy) will be on their respective teams next season. Ditto for head coaches Chan Gailey (my guess is he’s not back) and Rex Ryan (probably gets one more year). Pittsburgh vs. Cleveland: I think it’s safe to say the Steelers’ hearts won’t be in this one. And you know the Browns would love to complete a rare season sweep for their owner Jimmy Haslam, a former minority owner (and big fan) of the Steelers. I am guessing every team under the “good” has been used other than Tennessee, so the Titans are be the choice if that’s the case. Good luck!